Figures for the UK economy due on Thursday morning are expected to show growth after nine months of recession. Gross domestic product (GDP) figures, measuring the value of everything produced in the economy in the three months from July to September, will have been boosted by the Olympic Games. 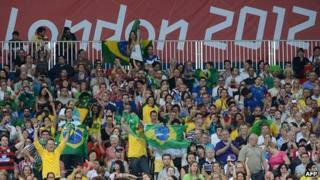 Ticket sales for the Olympics and Paralympics will be included. The Office for National Statistics' (ONS) first estimate is expected to show growth of about 0.7%. It will also be enhanced by comparison with the previous three months, because the second quarter had an extra public holiday as part of the Diamond Jubilee celebrations in in June. The ONS said that the extra day off had knocked 0.5% off economic growth in the second quarter. It also said ticket sales would add about 0.2% to GDP. So excluding the Olympic and Jubilee effects, growth seems to have been broadly flat, as it has for some time, showing either small amounts of growth or small contractions. "Putting aside the quarterly swings over the past two years, the economy has been and remains 'flat on its back' with stagnant growth," said Rob Donaldson from the accountants Baker Tilly. In a speech on Tuesday, Bank of England governor Mervyn King warned he expected that to carry on. "The zig-zag pattern of quarterly growth rates of GDP that we have seen this year is likely to continue," he said. He also pointed out that despite the expected end of the double-dip recession, GDP was still "barely higher than two years ago", which means it is still well below pre-recession levels. Of the three months covered by the third-quarter GDP figures, we already have almost all of the figures the ONS uses for July and some of the figures for August. The service sector, which accounts for more than 70% of the UK economy, grew by 1.1% in July compared with June. The index of production, which covers most of the rest of the economy, including manufacturing, mining and energy, grew 2.9% in July compared with June. Much of that increase was put down to the effect of the extra public holiday, and the official figures showed a contraction of 0.5% in August. The volatile figures for the construction industry showed 2.1% growth in July compared with June and a 0.9% contraction in August. Official figures on the service sector in August are not yet available, but the influential purchasing managers' index of the sector from Markit/CIPS rose to 53.7 in the month, up from 51 in July. Any number above 50 indicates growth. So the figures so far support the case for modest growth in the third quarter, but the fourth quarter may struggle to overcome the comparison with the Olympic-boosted third quarter. That means that while the UK is likely to be out of recession, commonly defined as two consecutive quarters of negative growth, there is a real danger of further contraction in the fourth quarter of the year. What has been your experience of the UK economy this year? Send us your comments using the form below.